Back of the Cereal Box: The 2010 Olympic Mascots: Cute or Adorable? So the mascots chosen for this current Winter Olympics are very cute, very graphically current, and very likely the kind of characters children will want emblazoned on their hats, shirts, backpacks, footy pajamas, snowsuits and bedspreads. Good on you, committee that foresaw the marketing opportunity that resulted from this winning formula: a little Sanrio by way of a sanitized Happy Tree Friends, drawn in the style of Samurai Jack. 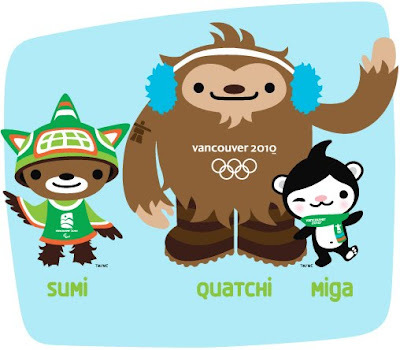 I am led to understand that the one on the left — Sumi, some sort of mishmash of thunderbird and black bear — is actually the mascot of the 2010 Vancouver Winter Paralympics, while Quatchi the sasquatch and Miga the “sea bear” (orca + Kermode bear) represent the games currently airing on TV. There’s apparently an “extra” mascot: Mukmuk the marmot. I have yet to figure out what he does aside from add an additional character to the line-up that children (first)worldwide must now collect. 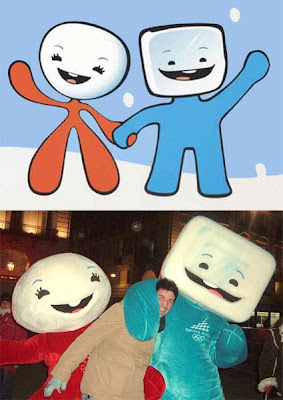 These four are certainly a step up from the abstract nightmare that was the mascot pair from the 2008 Winter Olympics in Turin: Neve and Gliz, the crudely drawn snow monsters that eat children’s hearts and want to blanket the world in a permanent blanket of life-stifling ice. 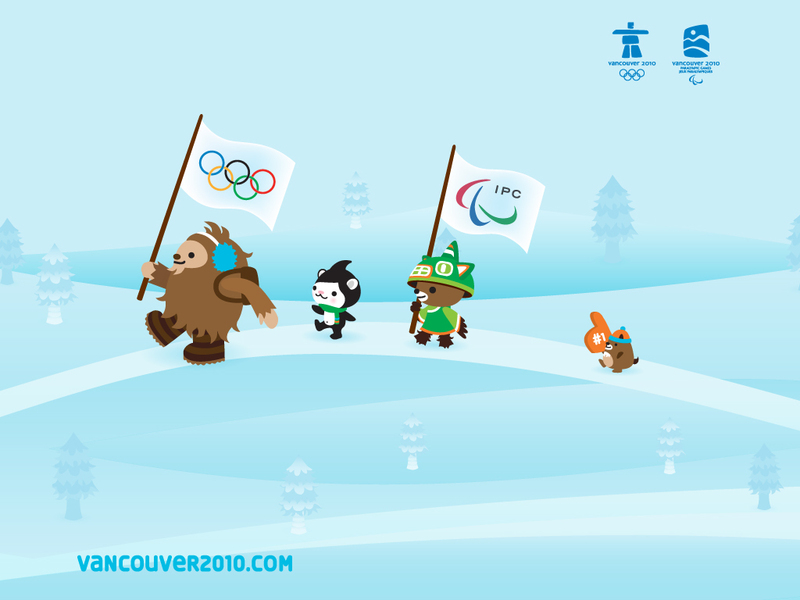 Even worse, the mascot for the 2008 Winter Paralympics is Aster, an anthropomorphic snowflake who lacks arms and legs. But in the small amount of Olympic mascot research I felt compelled to do this morning, I think I’ve found my favorite of all: Waldi the dachshund, emblem of the 1972 Munich Summer Olympics and the first-ever official Olympic mascot. Just from an aesthetic viewpoint, Waldi has class. Artist Otl Aicher clearly designed the dog to look dignified and not just sell T-shirts to screaming eight-year-olds with sticky cotton candy hands. With his cool color scheme (picked to exclude red and black, colors of the Nazi party) and abstracted Charley Harper-esque shape, Waldi looks a little more grown-up than the googly-eyed terrors that have roamed previous games. (Remember that sin against God that was chosen to represent the 1996 Atlanta games?) Waldi’s form was so celebrated, in fact, that the 1972 Olympic marathon was designed to resemble him. But all of Waldi’s virtues that I’ve mentioned so far pale in comparison to one fact I learned about him from his Wikipedia page: “Waldi was based on a real long-haired Dachshund named Cherie von Birkenhof.” There you go. That clinches it. A real-life dog with a given name and surname, no less. And, of course, anything involving a dog with a last name makes that thing the best of its kind ever. In conclusion: an Olympic-related but non-mascot-related matter: Is anyone else unnerved by the fact one of the official Winter Games sports is called skeleton? EDIT: Going through and closing Olympics-related tabs, I found the page for the Fuwa, the five little monsters that represented the 2008 Beijing Olympics. Apparently, they are cursed. 1. )He's the only mascot to star in a video game (that I know of). 2.) He's the only mascot that I actually remember (probably due to reason #1). Technically speaking, the Beijing mascots and the current ones appear in the associated Mario & Sonic at the Olympic Games video games. But I can't actually say for sure what they do, because I can't motivate myself to care about those games.